Dr. Osamah Al Jumaily is a Consultant Urologist with over 20 years of distinguished medical career spanning across countries. Dr. Osamah completed his MBCHB from University of Baghdad - Iraq in 1992 and medical specialisation in 1998 from Iraqi Board of Urology. He became Member of the Royal College of Physicians and Surgeons of Glasgow (MRCS) in 2005. He then completed his Fellowship in Minimal Invasive Surgery followed by Diploma in Laparoscopic Urological Surgery from Université de Strasbourg – France in 2012. In 2017, he added another education qualification to enrich career by completing Clinical Fellowship from department of Urology - University of Toronto, Canada. 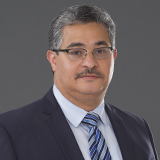 Dr. Osamah started his career as an intern, Resident House officer in Medical City Teaching Center, Baghdad – Iraq. Amongst many other notable medical institutions, he was also associated with Sheikh Khalifa Medical City – Abu Dhabi as Acting Consultant Urologist. He is associated with Nadia Medical Centre as a visiting Consultant from 2011. Prior to joining Nadia Medical Centre as full time Consultant in 2017, he was last associated with Men’s Health Institute, Toronto, Canada as Consultant Urologist. As Urol-Surgeon he promotes and practices Infertility Surgeries, male reproductive medicine & andrology and kidney transplantation amongst many other procedures. He has presented at multiple conferences and remains involved in chapters and multiple articles and continue to contribute passionately towards creating awareness programs for managing one’s own health. Dr. Osamah speaks Arabic and English. Language Known : Arabic and English.